The European-Japanese planetary mission BepiColombo lifted off from the European spaceport in French Guiana at 03:45 Central European Summer time on 20 October 2018 (22:45 on 19 October local time), on board an Ariane 5 launch vehicle. "Not only is the mission designed to investigate the planet Mercury, it will also deliver new insights into the Solar System," explains Walther Pelzer, Executive Board Member for the Space Administration at the German Aerospace Center (Deutsches Zentrum für Luft- und Raumfahrt; DLR). "Once again, by rising to this immense challenge, Japan is proving to be a dependable aerospace partner for Europe." The spacecraft's cosmic journey through the inner Solar System will last approximately seven years. BepiColombo is the most comprehensive European project to explore a planet in the Solar System to date. The mission consists of two orbiters that will circle Mercury – the Mercury Planetary Orbiter (MPO) and the Mercury Magnetospheric Orbiter (MMO). While MPO is designed to investigate the surface and composition of the planet, MMO will analyse its magnetosphere. Other mission objectives include investigating the solar wind, the inner structure and the planetary environment of Mercury, as well as its interaction with the environment nearest to the Sun. The scientists hope that this will also deliver new insights into the formation of the Solar System. During the voyage, both orbiters will travel on board the Mercury Composite Spacecraft (MCS), which will supply them with power and, thanks to a special shield – the MMO Sunshield and Interface Structure (MOSIF) – protect them from the extreme temperatures that vary between 430 degrees Celsius on the planet's day side and minus 180 degrees Celsius on the night side. Of the 16 instruments on board the two spacecraft, three were primarily developed in Germany: BELA (BepiColombo Laser Altimeter), MPO-MAG (MPO Magnetometer) and MERTIS (Mercury Radiometer and Thermal Infrared Spectrometer). MERTIS is an infrared imaging spectrometer and radiometer with two radiation sensors that will operate in the wavelength region of seven to 40 micrometres. Once in orbit, MERTIS will study the surface and interior of Mercury aboard MPO. With a spatial resolution of 500 metres, it will identify rock-forming minerals on the surface in the mid-infrared range. Knowledge of the mineralogical composition allows scientists to make statements about the evolution of the planet. In addition, an integrated micro-radiometer will provide data on the surface temperature and thermal conductivity of Mercury. Thanks to an innovative instrument concept, MERTIS is extremely compact and energy-efficient. "Both MERTIS sensors are unique," says the DLR experiment manager Jörn Helbert and adds: "The imaging channel uses a so-called uncooled microbolometer – the first to be space-qualified in Europe – using a sensor measuring only three by one millimetre, which was made from one piece of silicon and also serves as a slit for the spectrometer. These are just two of a number of innovative technologies developed specifically for this experiment." The team is headed by scientists from the University of Münster and the DLR Institute of Planetary Research. The experiment is managed by the DLR Institute of Optical Sensor Systems, which designed and developed MERTIS. The operation is carried out under the direction of the DLR Institute of Planetary Research, while the scientific evaluation of the data is carried out with the University of Münster. The BELA laser altimeter provides information about the global shape, rotation and topography of the planet closest to the Sun. Every second it sends 10 laser pulses towards Mercury and receives the signal reflected from the surface in a fraction of a second. The higher a landscape point is located, the shorter the time required for the laser pulse to travel to the surface and from there to BELA's sensor. From the duration of millions of laser pulses, a 3-D model of the entire surface of Mercury will emerge in the course of the mission. "In addition, we can use the shape of the reflected pulses to determine the surface roughness, which helps us better understand the physical and geological processes shaping the planet," explains Hauke Hußmann, scientific project manager of BELA. Sophisticated protective measurements and comprehensive heat and light protection prevent the instrument from overheating or radiation damage to occur due to the extreme temperatures on the planet. BELA was developed and built by DLR in collaboration with the University of Bern, the Max Planck Institute for Solar System Research, the Instituto de Astrofísica de Andalucía and industry. The operation and scientific evaluation of the data takes place under the direction of the DLR Institute of Planetary Research. The MPO-MAG experiment is a high-resolution digital magnetometer. As already discovered by the Mariner 10 probe, Mercury is surrounded by a magnetic field with a strength that corresponds to one percent of the Earth's magnetic field. In MPO-MAG, two sensors are used on one of the MPO's arms to investigate Mercury's magnetic field. One of the goals is also the exploration of the internal structure of Mercury. Karl-Heinz Glaßmeier from the Institute for Geophysics and Extraterrestrial Physics (IGEP) of the Technical University of Braunschweig is scientifically responsible. 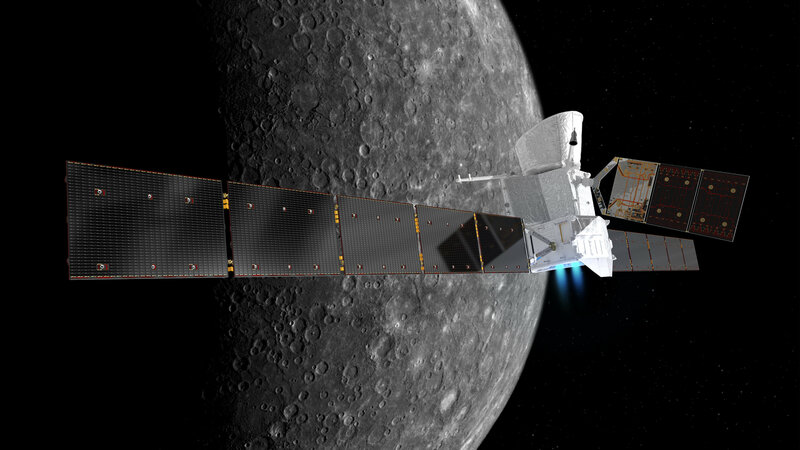 It will take BepiColombo approximately seven years to reach Mercury. During this time, the spacecraft will perform several swing-by manoeuvres past Earth and Venus and even six at Mercury itself before being directed into its final orbital trajectory at its destination planet. During these swing-by manoeuvres, the spacecraft uses the gravitational force of celestial bodies to gather momentum for its continued travel through space, or, and also, to decelerate. For an orbit to be achieved, the probe must not only greatly reduce its velocity at Mercury, but also counteract the Sun's enormous gravitational pull. MERTIS will already be performing measurements during the swing-bys of Earth and Venus. Once it has arrived at Mercury, BepiColombo will collect data for approximately one year. Mercury is more than just the smallest planet. With a diameter of 4878 kilometres it is barely larger than the Moon. It is also the least researched of the Solar System's Earth-like planets in our solar system. Above all, this is due to the fact that it is the closest neighbour to the Sun, which blasts the surface with radiation six times higher than on Earth, causing temperatures to rise to as high as 430 degrees Celsius during the day, before cooling down to even minus 180 degrees Celsius at night. Only two spacecraft have visited Mercury in the past: NASA's Mariner 10 performed three fly-bys past Mercury in 1974 and 1975, while the NASA probe MESSENGER performed three fly-bys and circled our neighbour while approaching the northern hemisphere of our planetary neighbour on an exploratory mission between 2011 and 2015. BepiColombo will complement the Messenger mission perfectly, as the southern hemisphere can now be captured accurately as well. At the same time, completely new investigations will be carried out. No instruments on MESSENGER observed the planet in the mid-infrared range. Therefore, MERTIS will supply a completely new dataset. ESA is responsible for the overall mission, and the agency was also responsible for developing and building the Mercury Planetary Orbiter. The Japanese space agency JAXA contributed the Mercury Magnetospheric Orbiter. The German part of the BepiColombo mission was coordinated and largely financed by DLR Space Administration using funds provided by the German Federal Ministry for Economic Affairs and Energy (BMWi). The two instruments BELA and MERTIS, which were largely developed by the DLR Institutes of Planetary Research and Optical Sensor Systems in Berlin-Adlershof, were essentially financed from means provided by DLR Research and Technology. The mission also received support from the Max Planck Institute for Solar System Research (MPS) in Göttingen, the University of Münster and TU Braunschweig. A European industrial consortium led by the firm Airbus Defence and Space is contributing the industrial part of the spacecraft.